Skiers and snowboarders who have spent time in the backcountry generally agree that exploring out of bounds terrain is the pinnacle of the sport. Backcountry exploration offers a host of unique experiences and opportunities that present, for many a full picture of what skiing or snowboarding is all about. 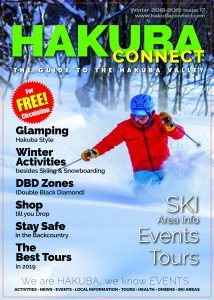 The Hakuba Valley with the 3000 meter high peaks has some of the world’s best backcountry terrain. This includes the famous Happo North Faces, the area visible behind the Happo-one ski area. Access to this area is by Backcountry Gates and usually by joining one of the professionally guided Backcountry Adventure tours offered by Evergreen Outdoor Center. Some skiers, like 20 year Hakuba resident and Evergreen Outdoor Center Director and Chief Guide, Dave Enright, ride the off piste and backcountry terrain here in the Japanese Northern Alps exclusively. Dave logs over 100 days a year ski and snowboarding with the majority of those outside the ski area boundaries. We are sure that Dave could fill this entire magazine with backcountry safety tips and route recommendations, but some of the most important considerations include planning ahead for weather and snow conditions, educating oneself in avalanche safety and knowing how to navigate the uncontrolled backcountry terrain. With Dave’s 2 decades of experience exploring and guiding in the Japan Alps and another decade plus in the Canadian Coast Mountains he is a definitely a good resource for mountain safety and local routes. We asked Dave what he did differently on routes he was familiar with and new terrain where he had never been in before. Dave starts out talking about his early days of ski touring in Canada when he was still in Jr. High School. “I first gained my experience with family members and my friends parents who were into ski touring and ‘Out of Bounds’ skiing when I was about 13. I pretty much followed their lead. I learned about beacons when there was only the old 257 Khz analog ones with ear pieces and no flashing lights. We all got together the night, or a few nights before heading out to make sure we had all our gear, food and a plan. The leaders would pretty much have this all set out and have an idea about weather, some info on routes and the snow conditions that they received off of their friends, the ski patrol or the parks bulletins. I learned a lot about route finding and snow camping in those days but was never satisfied with the low angle lines that we were skiing and tried to push it a bit further at every chance. 1.”No Skiing Zones” are areas where very dangerous avalanches are easily triggered. These areas are off limits. Violators will lose their lift privileges. The Ski Patrol will occasionally enter “No Skiing Zones” to conduct safety checks and do avalanche control work. and warnings, and to follow the instructions of the Ski Patrol. 3. The mountains beyond the ski area borders are National Park Land, and not managed by the ski areas. 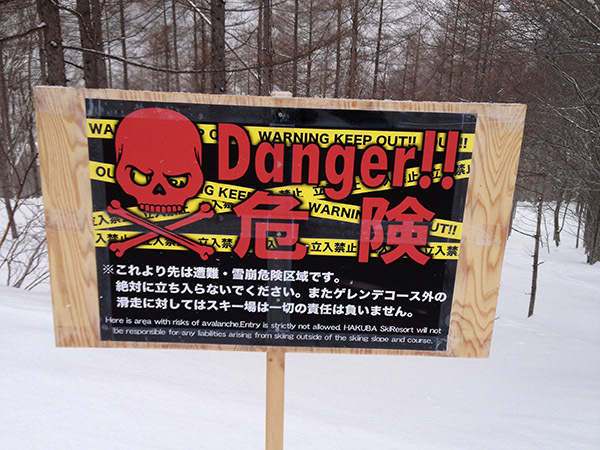 Venturing outside ski areas boundaries in winter is extremely dangerous. 4. Any accident outside ski area boundaries that requires the search and rescue efforts of the Ski Patrol or the Kit-Alps Northern Mountains Safety Bureau will be at the full expense of the individual(s) requiring assistance. 5. All guests must follow the instructions of the Ski Patrol and other authorities both within and outside the ski area. 6. It is the responsibility of all guests to consider not only their own safety, but also the safety of others, at all times. Dave recommends that if you have the time and your trip coincides with a program itinerary then take an Avalanche Skills Level 1 course or level 2 if you already have level 1 before exploring the backcountry, and encourages taking additional courses in first aid and wilderness survival. Navigation skills are also essential, all backcountry users should be able to use a map and compass, and have “white out” navigation skills in case bad weather blows in during the trip. Without a doubt the best and safest way to discover the Hakuba Valley backcountry untracked steep terrain is by joining one of the back country tours offered by the extremely professional guides at Evergreen Outdoor Center. All the backcountry participants will be asked to attend a pre-tour briefing the evening before to meet the guides and go over routes, organize gear and rentals.